With the new year close enough that I'm already hearing fireworks across Lake Hickory, it's safe to assume my reading for the year is complete. Although I know I omitted some of the books of poetry I read this year and some of my school reading, this is as complete a list as I can. Some I have written about here; some I still will (especially the last few). I'd love to hear feedback to know what others read this year and recommend. 18. Phillips, Gin. Come in and Cover Me. 23. Hiassen, Carl. Nature Girl. 28. Wilson, Tamra. Dining with Robert Redford. 30. Larsen, Erik. In the Garden of the Beasts. 32. Carty, Jessie. Amateur Marriage. 33. Bradley, Alan. The Weed that Strings the Hangman’s Bag. 44. Flynn, Gillian. Gone Girl. 50. Chevalier, Tracy. Remarkable Creatures. 58. Semple, Maria. Where’d You Go, Bernadette? In a few days, I'll be compiling the list of all the books I read during 2012, first copying them over into the little "Book Woman" notebook someone gave me years ago, then posting my list here. I read awhile back that Art Garfunkel has kept a record of the books he's read since his teenage years. How I wish I had done the same. But I didn't. I have a system now, writing the title of every book I finish on the wall calendar that hangs in my laundry room. Each year my son John tries to pick the most outrageous, hilarious calendar possible, and the laundry room is a safe enough place to hang it, out of everyone else's sight perhaps, but right where I can see it and record my day-to-day business. The book list, though, is most valuable to me. For now, though, I am thinking ahead to the list of books I hope to get around to reading this coming year. I have tried this kind of list before, and I rarely read half because other books make an appearance, and I'm lured away. A few of the books on my to-read list come from friends. One, nearly family, gave me a book her fifteen-year-old daughter bought for me because it's her favorite book, Walter Dean Myer's Monster. I also plan to read The Kitchen House by Kathleen Grisson and Accordion Crimes by Annie Proulx, both on loan from a friend at work. I also plan to read Katherine Boo's Behind the Beautiful Forevers, set in a Mumbai slum. I also plan to read Ken Follet's Winter of the World, the second in his Century Series. After meeting the author at the North Carolina Writers Network fall conference, I also look forward to reading Binocular Vision, Edith Pearlman's short story collection, winner of the National Book Critics Circle Award. I gave Anne Lamott's Help, Thanks, Wow! as a Christmas gift, but I plan to read it myself. I also hope to read Zadie Smith's NW. I also think I want to read Louise Erdrich's Round House and Barbara Kingsolver's Flight Behavior. I'm also holding on to my newest collection of Lee Smith's short stories Mrs. Darcy and the Blue-Eyed Stranger I bought when she spoke at our conference of English instructors. I tend to claim not to read much nonfiction, but my list shows otherwise. I am interested in reading Far from the Tree by Andrew Solomon, about the experiences of parenting a wide range of "exceptional children." I also plan to read through The Happiness Project starting in January, with a little side project of my own. I'm also drawn to The Art Forger, based simply on the title and a brief blurb, and I liked Still Alice enough that I might want to read Love Anthony by Lisa Genova. Based on recommendations, I may also need to read Kevin Powers' The Yellow Birds and Junot Diaz' This Is How You Lose Her. Since I don't live in a vacuum, in fact, since my world is peopled by readers, avid, voracious readers, I know that over the next few days, I'll be hearing what books others read during the holidays or received or gave as Christmas gifts, and there will go my best-laid plans. Fortunately, I know that whatever else I'll be doing, I will be reading in 2013. Swamplandia is set in the swamps of Florida on an island housing a family-owned, nearly defunct alligator park--Swamplandia! (Yes, the exclamation park is part of the name and the book title.) As the book opens, Ava Bigtree, the youngest daughter narrates after her mother, the great gator wrestler Hilola Bigtree, dies of cancer. The mother's death affects them all, as does the opening of the nearby World of Darkness, a hell-themed amusement park, less nostalgic than Swamplandia! Ava feels compelled to train to take over her mother's role; her sister Osceola reads a book on spiritualism and falls in love with a ghost. Brother Kiwi Bigtree runs away from home and takes a job at World of Darkness, hoping to save the family and the park from economic doom. When Kiwi leaves, Russell begins alternating between a third person narrator of the segments involving him and the first person account of Ava, the not-quite-naive narrator. When their father leaves the island for a long period, Ava ends up alone, her sister eloping with her ghost, Kiwi out of touch. The arrival of The Big Man, a gypsy who rids the area of bird of prey, produces the real tension of the story as Ava innocently seeks someone to love and trust when left to survive on her own. Russell's writing is often lyrical without drawing undue attention to itself. She develops her setting so clearly I could feel the damp, could smell the swamp. Despite the grand pretensions by their father, the self-proclaimed Chief, readers rarely lose sight of the real story--a family that falls apart after losing their mother. I read Ishiguro's novel Remains of the Day long ago, but I am still struck by the subtlety of the book, much of which Anthony Hopkins was able to convey wordlessly in the film version. 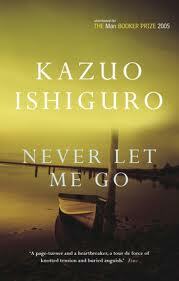 I recently read another of his novels--one he published in 2006--Never Let Me Go, and I wonder whether, had I not known the books shared the same author, if I would have considered Ishiguro a likely candidate? Though this novel might be classified science fiction, the characters were so fully human that I would not have suspected they were actually clones if I had not been told. The world in which Cathy H. and her fellow "students" (the name preferred for clones by their "guardians") live is sometime in present day or recent England. Kathy H., the narrator, is a "carer" in her thirties as she tells the story of her life, beginning with her years at Hailsham, an exclusive school for clones. The life she describes could have been that of any teenagers raised in a boarding school. Only gradually do readers realize the students are unusual in that they are clones, bred and raised eventually to become organ donors. Because this is the only life they have known and because they are given information about themselves often before they are mature enough to process it, they alternate between blind acceptance and curious scrutiny of their futures and their personal situations. Because the plot does not deal with the actual science behind their creation or their donation, it is mainly a character-driven tale, with a narrator who reveals more about herself that she seems to realize. The relationship triangle involves Kathy H., her best friend Ruth, a controlling, manipulative queen bee, and Tommy, a boy first bullied because of his temper and lack of creativity who eventually becomes Ruth's boyfriend, even though readers recognize early on that he and Kathy H. are much better suited. What strikes me most, looking back at the story, are the implications about quality of life. Kathy and Tommy eventually track down two adults that played important roles in their life at Hailsham and learn that their time at Hailsham was part of an experiment, exposing students to meaningful lives of art, music and literature, before their inevitable deaths. They learn that most of their clone peers in other situations are raised in squalor, more like farm animals or lab monkeys that esteemed individuals. While some seem to imply the students were duped into creativity and lulled into complacency about their inevitable future, I wonder if the dominant lesson is that since everyone is filling time between birth and death, shouldn't the time be marked meaningfully? Even after graduation, before they become "carers" for donors before becoming donors themselves, Kathy and her fellow residents are granted time to read and to write. They have some access, though limited, to the outside world. They even choose to spend some of that time searching for or speculating about "possibles"--the source of their original DNA makeup--not unusual for any humans with unanswered questions about our origins and our eventual destinations.